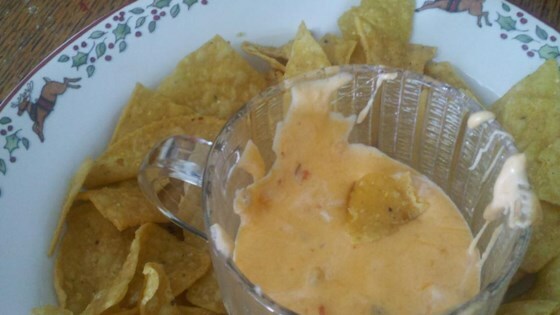 "Otherwise known as cheese dip, this is a great recipe for any get together. Cheddar cheese is melted into a smooth, thick mixture. Bring along a couple copies of the recipe, people will ask for it!!" It is a very good dip with modifications. To make it a smoother consistancy I used Velveeta. This allowed me to cut out the butter and corn starch. Excellent and simple. Once you've figured out how easy cheese sauce is with real cheese, you'll never use velveeta again. Excellent recipe! This is the best queso dip I have EVER tried!!!!!! It is better then any restaurant dip I have ever had too!! You have to try it!!! YUMMMY!! Not a huge fan of this recipe - it came out very "fluffy" and didn't taste very cheesy at all. Very good...I did use 1/2 sharp cheddar and the other 1/2 was velvetta to get a smoother consistency. Thanks for the post.